The Universal Royalty Beauty Contest is planning to proceed with its Belfast pageant. THE DECISION BY US beauty pageant organisers not to proceed with two contests in Dublin and Cork has been welcomed by Senator Jillian van Turnhout. 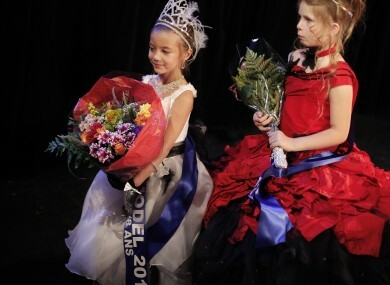 It is believed that the Toddlers and Tiaras-style child pageant will go ahead in Belfast. Last year a motion put down by the senator condemning child beauty pageants was passed by all members. The Universal Royalty Beauty Contest caused commotion last year, as the organisers found it difficult to find a premises that would agree to hold the contest. Speaking to TheJournal.ie, Turnhout said that it was “great news” that the pageants in the Republic had been cancelled, saying that “it really shows that if the people of Ireland get together something like this can be achieved”. She urged her colleagues in Belfast to follow suit and condemn child pageantry. She added that the Irish hoteliers also had to be commended for not letting pageants like this to go ahead on their premises. “I did meet with the pageant representatives and I made it clear that I would push for legislation on this,” she said. “This gave us the opportunity to debate the wider issue of what define childhood as here in Ireland. We got to see the extremes of what happens in the US and we were able to take a step back. Adults have a responsibility to protect children. Childhood goes by so quickly, so really this matter was a catalyst for a wider issue of child protection,” she said. “It shows that we don’t always have to go down the legal route when there is such support for an issue. The message received was that they were not welcome here. The fact they decided not to come to Ireland is a real tribute to the Irish people for taking a stand,” she added. Email “It's 'great news' that child beauty pageants have been axed - Senator”. Feedback on “It's 'great news' that child beauty pageants have been axed - Senator”.